These days, we can view and share photos almost as fast as we can capture them. With a quick click of a button, your photos can be stored and sent to friends, relatives, and social media sites. This type of image sharing is fun and fast—and everywhere—but for special occasions you may want to be able to tell a story with more color, creativity, energy, and style. Digital scrapbooking—creating electronic scrapbook pages you can share—gives you the best of both worlds, letting you gather favorite images quickly and then using them to create a layout that tells the larger story in a rich and meaningful way. iRemember 2.5.1 is a digital scrapbooking program that is designed to help you gather, fine-tune, and share your favorite images in customizable page layouts that you can tailor to create a story larger than a single photo can tell. You can combine your favorite photos with other design elements—page backgrounds, clip art, formatted text, and more—to craft vibrant pages that showcase your pictures. The program launched easily and quickly enough, but past that point it didn’t do much to make a new user feel at home. For example, even if you are launching the program for the first time, a dialog box immediately appears asking you to choose the size of the page you want to create. That's not too friendly and—especially if you haven’t created a scrapbook in awhile—it may leave you feeling somewhat baffled about what to do next. The next step in the process isn’t intuitive either, because then you have to search for a page template—assuming you want to use one. 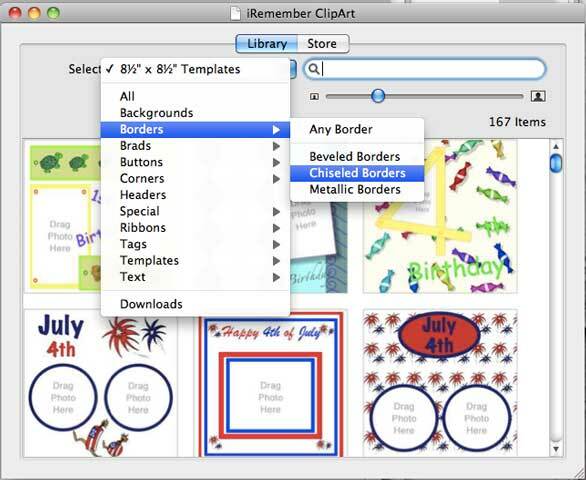 You’ll find templates in iRemember's ClipArt browser, available from the File menu. One upside is that the templates in iRemember are colorful, if elementary, and offer a range of styles that should appeal to different users with a variety of subject interests. It's relatively easy to create scrapbooks with iRemember, once you get started. I especially liked the Inspector, once I located it: it's reminiscent of iWeb's inspector and easy to use. You might want to keep iRemember's Website available, as its handy online tour provides most of the background and instruction you need to produce your scrapbook. There are two simple tutorials available in Help as well; you can open the PDFs and follow the instructions as you create your first scrapbook onscreen. 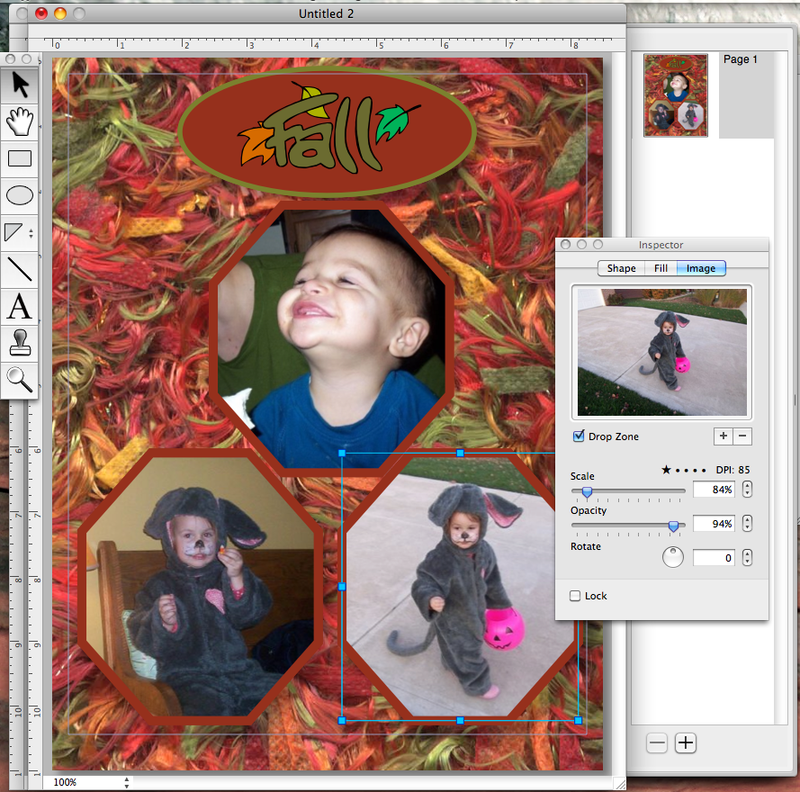 iRemember comes with a sweeping collection of images, such as backgrounds, borders, ribbons, and embellishments. The search feature in the iRemember ClipArt browser lets you locate templates that fit the mood you’re after. For example, enter the words graduation, birthday, or anniversary to find templates designed specifically for those events. There’s also an iRemember store that you can access directly from the Inspector. It offers additional templates and embellishments (the small extras you can add to the page like ribbons, buttons, tiles, and more) that you can purchase. iRemember ships with a sweeping collection of 15,000 images—backgrounds, borders, ribbons, and embellishments of all kinds. Simply click the Select arrow, point to the category you want, and click the style. When you see the item you want in the ClipArt dialog box, drag it to your page. Adding your photos is also a fairly simple process in iRemember. You can just drag and drop the image from iPhoto or you can access photos from a flash drive, external disk, CD, or DVD. Working with images on the page is also straightforward once you think to open the Inspector from the Window menu (in a more intuitive process this could be open by default). Using the Inspector, you can change the shape of the image, modify the intensity of the colors, and scale and crop the images as needed. What’s missing is any kind of brightness/contrast or red-eye removal control, so although you can modify the image for its placement and design on the page, you can’t do real image editing in the program. You’ll need to edit your images before you prepare to add them to your iRemember page. You add text on the scrapbook page (which iRemember calls journaling) by clicking in a template text block and adding your own text or by clicking the Text tool and creating your own block. The text controls are flexible, giving you a full range of fonts, styles, colors, and sizes. Finally, iRemember gives you a few options for sharing the files you create. In addition to printing the scrapbook page on your color inkjet printer, iRemember makes it easy for you to export the page as a JPEG or PDF file so that others can view your pages. Adding photos to the iRemember template is easy. Just drag and drop images from iPhoto, your hard drive, or an external source. Overall, iRemember 2.5.1 has some good points. It provides a set of tools that help you create pages, place photos, and add text without a lot of fuss. If you want to create fairly basic scrapbook pages with a simple, colorful design, iRemember could be a good fit. The program seems to lack a sense of cohesiveness, though, and it feels more like a collection of tools you need to figure out how to use rather than giving you a smooth process you can follow from start to finish. If you want your scrapbooking software to provide the workflow that gives you the freedom to create, iRemember may leave you wanting more.